Located at the heart of the picture perfect Pahalgam Valley, the Hotel Hilltop defines luxury and comfort at its best. 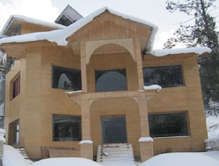 The hotel is very close to the popular tourist attractions like Kolohoi Glacier and River Lidder, and thus is certainly one of the most preferred hotels for spending holidays in Pahalgam. In addition to its location, it is the architecture of the hotel that helps it in making way into the hearts of the visitors. Contemporary architecture with strokes of creativity visible in every corner is among the main USPs of the Hotel Hilltop. Accommodation The Hotel Hilltop offers a wide range of accommodation options to the guests via 34 Normal Suites, 28 Double Deluxe Rooms and 2 Maharaja Suites. These 64 highly spacious and lavish rooms of the hotel offer a cozy and warm ambience to the visitors. These rooms are fully furnished and equipped with all the modern day amenities like mini bar, multi channel satellite TV, free high speed internet access, water heating systems and a telephone with international calling facility. All these amenities ensure that the visitors enjoy a complete 5-Star comfort and spend their holidays in a royal manner. Dinning The multi-cuisine restaurant of the Hotel Hilltop has been built with the sole motive of tantalizing the taste buds of the guests. Prepared with the freshly procured ingredients, the grub of the restaurant is finger-licking-good. Further, the delectable food is complemented by the perfect setting of the dining area. The wonderful furniture, prefect lighting and prompt service, make the guests simply fall for the restaurant as well as for the hotel. We, at Tour My India understand that which hotel defines luxury at its best, and the Hotel Hilltop is certainly one of them. 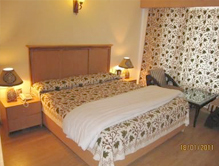 Considering the same, we offer you easy booking in Hotel Hilltop, Pahalgam.